Picking the right font for your presentation is probably the most important part of designing a PowerPoint slideshow. If your font isn’t readable, you’ll have a confused audience. We explored the web to find this collection of the best fonts for PowerPoint presentations to help you choose the best font for your slideshow design. When designing a PowerPoint presentation it’s easier to just pick a font from the default fonts collections installed on your computer and just finish making the slides. But, a unique, custom font can help you create a winning presentation that shows off professionalism. Choosing a unique font with the right weight and creative design will allow you to not only design a presentation that looks more original, but also to quickly attract the attention of your audience. In this collection, we’re featuring some of the best fonts you can use to design professional slides for all kinds of PowerPoint presentations from business to startup pitch decks, school presentations, and much more. Have a look. Metropolis is an elegant serif font family that comes with a mix of modern and vintage design elements. It features a design inspired by the 1927 Fritz Lang movie of the same name. This font is perfect for crafting business and professional presentation slideshows. RNS Miles is a modern sans-serif font featuring an attractive design. It’s been crafted with a combination of “geometric shapes, open forms, and grotesque mood”, which gives the font a unique look. The font includes 7 different weights with 7 italic versions of the font. Texteron is a professional font that comes in 6 different weights, including bold, heavy, and small caps font styles. The font features an elegant design that makes it perfect for designing the paragraph text of your PowerPoint slides. This family of sans-serif fonts comes with 8 different typefaces, taking the font weight from hairline to black. It also includes italic versions of each typeface, making a total of 16 fonts. This font is ideal for designing the headlines and titles of your slides. Italo is a creative sans-serif handwritten font that comes with a unique design. It’s most suitable for designing PowerPoint slides for entertaining, fun, and creative presentations. The font also includes lots of glyphs and alternate characters as well. Brother is a yet another creative font that comes with a bold design, making it best for using to design the titles of your slides. The font comes with both uppercase and lowercase letters, numbers, and punctuations. Addington is a family of serif fonts that feature a very formal design. It’s perfect for designing PowerPoint slides for business and professional presentations. The font comes with 7 different font weights including roman and italic sets. This serif font family comes with a unique design that makes it stand out from the crowd. It features a bold design with stylish serifs and includes font weights from light to black. The font also features ligatures and international characters. Cormier is a creative font that comes with an art deco inspired design. It includes 3 styles of fonts: Rough, Double, and Regular. The font features all-uppercase letters, numbers, and punctuations. This elegant family of sans-serif fonts is ideal for designing slides and other designs related to fashion and creative businesses. The font comes in 5 different weights with italic versions, making a total of 10 styles. It also includes 590 glyphs as well. Metrisch is a minimalist sans-serif font that features an elegant design. The font comes in 7 different weights to match both the titles and text in your slides. It’s most suitable for making slides related to business and professional projects. 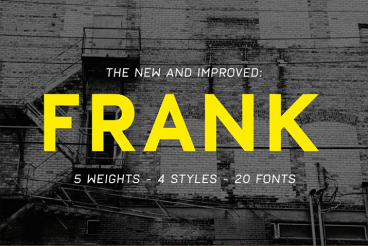 Frank is a bold font that comes with a modern design. It includes 4 different fonts, including oblique and rough styles. And the fonts are available in 5 different weights, making a total of 20 fonts. Bistro is a creative font with a handcrafted design. This font is perfect for designing slides related to creative work, kids, school presentations, and more. It comes with 3 different weights and in both serif and sans-serif versions. This cute and adorable font features a fun and quirky design that makes it most suitable for designing presentations related to fun events. It will especially help get the attention of children. Modelica is a family of sans-serif fonts that comes in 4 different widths, in 8 different weights, and each with italic versions of the font. This gives you a total of 64 fonts. You’ll be able to use this font family to design all kinds of slides. Venice is a serif font with an elegantly thin design. The font comes in multiple weights, including light, bold, and italic versions. It also includes 195 glyphs and it’s best for fashion and luxury presentation designs. Granite is a creative brush style font you can use to design bold and creative PowerPoint slides. The font includes lots of swashes and glyphs. It’s perfect for slides with colorful images and graphics. Bison is a bold font family that comes with several unique font styles, including regular and outline versions of the font. It also features italics, numbers, and punctuations as well. Martian is a modern family of fonts that features a design inspired by industrial signs. The font features an elegant design that makes it perfect for business and personal slideshow designs. Frosty is a creative font you can use to design the titles of fun and attractive slides. The font features a quirky design that will work well with colorful and minimalist PowerPoint presentations. This sans-serif font is ideal for designing creative and business slideshow presentations. The font features a design inspired by a font released in the 20th Century and it comes in 3 different weights.